Get to know two of our ESRs Antonia Weberling and Matteo Bernardello! 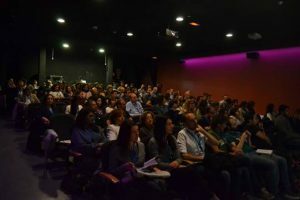 Here is a spot about our project and interviews with these two ESRs in German (from 10th minute) made by Radio Slovakia International during the Midterm review meeting in Bratislavain February 2019! 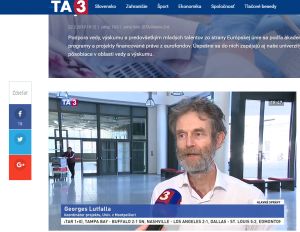 Slovak television TA3 was present at the outreach conference « EU support for research » organized by ImageInLife in Bratislava on 19th February 2019 and made a spot about the project and EU funding for research that was brodcasted in the evening news on 22nd February 2019. Link to the spot below (video only in Slovak). 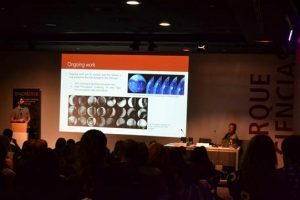 Matteo Bernardello (ESR9) gave talk on “Yolk microtubules organization’s dynamics in zebrafish embryonic development visualized through Light-Sheet Microscopy” at Spanish Portuguese Meeting for Advanced Optical Microscopy 2018 (Granada, 23.10-26.10.2018). 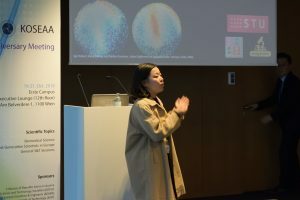 Seol Ah Park (ESR8) presented ImageInLife and her role in the project during « KOSEAA 20th Anniversary Meeting » on 19th October 2018 in Vienna. 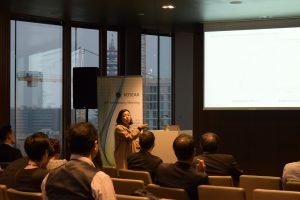 KOSEAA is an abbreviation of « Korean Scientists and Engineers Association in Austria ». 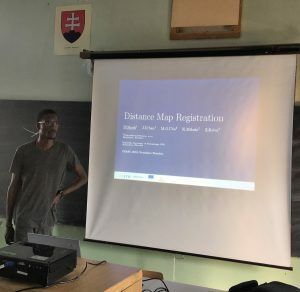 Polycarp Okock (ESR13) had presentation on Distance Map Registration on 13 September 2018 at the Meeting of the Czech, Slovenian, Austrian, Slovak and Catalan Mathematical Societies (CSASC 2018). 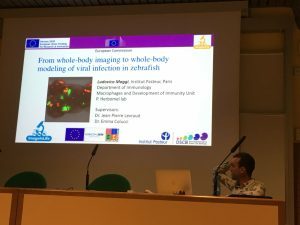 ESR10 Ludovico Maggi presented his ImageInLife project and Marie Curie Actions to the students of his home University of Pisa in Italy on 11 May 2018. 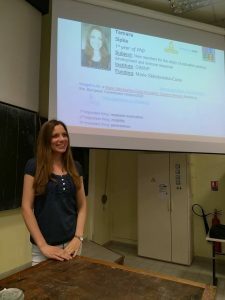 On 27 April 2018 our ESR1 Tamara Sipka presented her PhD project and the process of applying to MSCA ITN fellowship to the undergraduate students at the University of Montpellier. She also talked about Marie-Curie scholarships and advantages of studying abroad!